Today only. 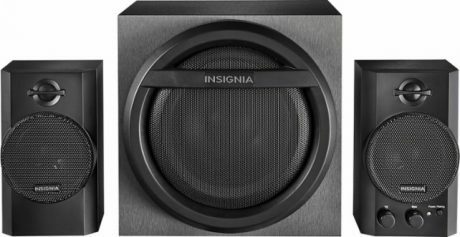 Best Buy has a Insignia 2.1 Bluetooth Speaker System (3-Piece) Sale, $19.99, free in store pickup or Free Shipping $35. Rated 4.3 out of 5 stars. Connect it to your smartphone or tablet to stream music wirelessly. 16W subwoofer and 8W per satellite. Adds quality sound to your computer. Has an Aux wired input, but reviews show this should not be used.